The one that started it all. This makes your hair so soft and shiny without weighing it down! I use the classic formula because I have super thick and naturally wavy hair. But if you have thinner hair or are weary of oil they have a light version too. I've featured the big bottle for $44, but they have mini versions that are only $15 if you don't want to make that kind of commitment! I've learned that oil in my hair for conditioning purposes works great, but I was pretty apprehensive about a shampoo that has oil in the name because my roots always get super greasy in less time than it takes me to eat a whole box of macaroni & cheese (aka very fast). 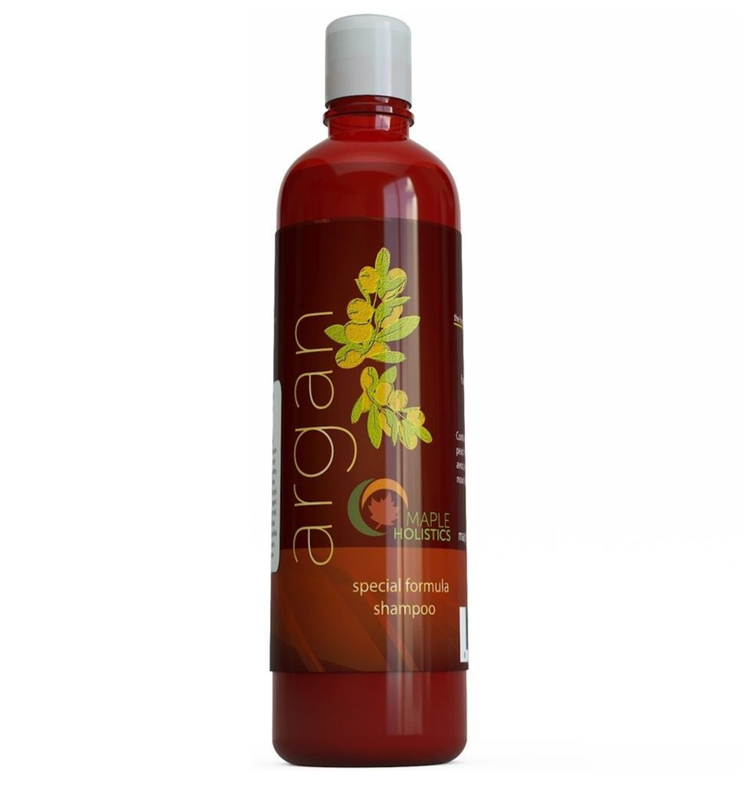 So when Maple Holistics contacted me about sending me their Argan Oil Shampoo to try I was skeptical, but y'all it is actually great! It conditions my hair without making it oily like I expected it to (moral of the story: don't judge a product by its name). Lucky for you they have free samples you can try! While you're on their site, be sure to check our their blog post on derma rolling. What's even crazier than putting oil on your hair? Oil on your face! But really, it's not that crazy—it's actually great for your skin! I have used Tarte's Maracuja Oil for years and it makes my skin so soft. A little drop goes a long way, so don't put too much on your first time! And if you're still skeptical, try using it at night before you go to bed. What are some of your favorite beauty oils to use? Comment below! Posted on January 17, 2018 by Brandy Borcicky. Fall is without a doubt my favorite season. Cooler weather, Alabama football, Halloween AND my birthday?! It's a no brainer. So in honor of my favorite time of the year, I wanted to share with you some of my favorite things for Fall. I love waking up when it's a little chilly out (one perk of not having air conditioning!) and making delicious warm coffee to drink in bed before I start my day. When I'm not in a rush I go the extra mile by using a French Press (You can get one for under 20 bucks on Amazon!) and then frothing your favorite creamer (I use Trader Joe's Soy Creamer) to add that Starbucks touch (Amazon to the rescue again at 10 bucks!) at home. Colored nails are still in and give a great pop of color to your outfit! I love choosing deeply saturated colors for Fall like this ruby red nail polish from Dior. It's a little pricey at $27, but the color is worth it! This summer I was a liiiiittle lazy with my tanning (even though I live by the beach—go figure), so I give myself a little color with a spray tan (L'oreal's Sublime Bronze is the best and only 11 dollars!) and a bronzer. Too Faced makes the best bronzer—I've been using it for years! Snow Bunny is great if you want a slight sun-kissed look and Sun Bunny for when you want a deeper color. I have been working hard lately trying to get my super fried hair back to normal. Between the sun, too much pizza, and dying my hair (plot twist: I'm not really blonde) my poor tresses have suffered. Maple Holistics must have super powers and knew my struggles because they contacted me and sent me a complimentary bottle of their Silk18 Conditioner! Ugh, what angels. This stuff is amazing and has helped my hair so much! It has essential oils and amino acids that have brought my hair back to life. It's only 12 dollars so hop on that! They also have a free samples page if you want to try their awesome products before you buy. Who doesn't love free stuff?! Not gonna lie, I rolled my eyes at all of the fall candle memes going around lately. And then I bought one from Target called Friendsgiving for only $15 and I get it now. It smells divine! And it's in the shape of a pumpkin and mercury glass and so cute and I'm in love. Dark, vampy lipstick is quintessential Fall. I'm not the biggest fan of matte lips but I love the feel of lipstick, so it's been tricky for me to find the right lipstick where my lips don't look 70 years older than me. This is where Dior's lacquer stick comes in and saves the day! It gives saturated color without drying out your lips and stays on forever. It's expensive ($35!) but honestly it's worth. Every. Penny. What are your favorite Fall products? Share in the comments below! Posted on October 13, 2017 by Brandy Borcicky. Bows, ruffles, and jumpsuits: my 3 favorite things! All it's missing is a slice of pizza. I would definitely knock drinks over in this top and it would definitely be worth it. Pretty colors + amazing brands + cute packaging = need. What's on your wishlist right now? Share in the comments below! Posted on May 3, 2017 by Brandy Borcicky. Posted on April 7, 2017 by Brandy Borcicky.